Richard Rufus has left his posts at Charlton after being found to have overseen a multi-million pound fraud. The 40-year-old accepted more than £16m from investors without authorisation and in breach of financial regulations, a case unconnected with the club. 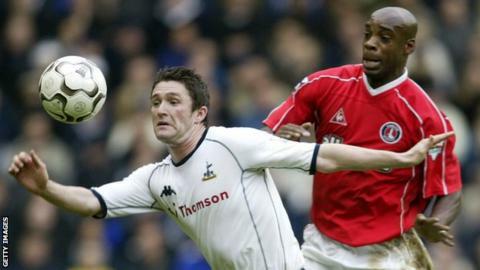 Rufus, who played for Charlton between 1993 and 2004, has left his roles with the club's academy and Community Trust. He was judged a fraudster by a specialist civil court judge at the High Court earlier this month. The club said in a statement they would make no further comment on Rufus' departure from The Valley. Bankruptcy registrar Clive Jones said the former defender's actions, which took place between 2007 and 2011, had "exploited trust and friendship" and were "in substance a fraud". Rufus lost more than £5m through currency exchange trading and used more than £3m for his "own purposes". He also gave money which came from the pockets of some investors to other investors and pretended that money was profit. The Financial Conduct Authority (FCA), which has the power to prosecute in such cases, refused to comment on the case.